Although there is some debate as to the specific month and day of the eruption, August 24 is the most common one given as the start of the Mt. Vesuvius eruption in 79 CE. The disaster buried the nearby cities of Pompeii and Herculaneum and caused one of the highest number of deaths by volcano in recorded history, with estimates ranging from 10,000 to 30,000. The area was prone to earthquakes, so few people paid heed to the rumbles leading up the eruption. By the time danger was obvious, it was too late for many. Most deaths were not caused by lava but by ash and pyroclastic flows. Over the span of several hours, ash piles buried single story buildings, collapsing roofs and suffocating those who sought shelter within them. Eventually, the cities would be buried under about 70 feet of ash, effectively wiping them off the map for 2000 years. Most deaths were caused by pyroclastic flows. Heavier than air, these collections of superheated gas, ash and debris roll across the ground rather than being fired into the atmosphere. Heated to several hundred degrees, the flows killed everyone it touched. The extreme heat caused muscles to contract, with stronger muscles winning out over weaker ones. The result is that many bodies were found in the fetal position, not because they cowered in that posture but because the heat created the posture immediately after death. Ash compacted and solidified around the bodies. As the bodies decomposed, they sometimes left voids in the ash which we have cast with plaster. Over 1000 casts have been made in Pompeii to date. 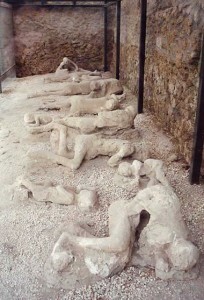 Meanwhile, over 100 skeletons have been found in Herculaneum, a town much smaller than Pompeii but closer to Vesuvius. Here, skeletons have not been found within buildings like at Pompeii (leaving archeologists to originally suspect a successful evacuation), but, instead, are huddled in empty boathouses, suggesting they expected rescue from sea after a few survivors left in the available boats. The only contemporary account of the eruption comes from Pliny the Younger, who watched the eruption from several miles away, where copious amounts of ash still fell. His uncle and adopted father, Pliny the Elder, was a commander of the Roman fleet and mounted a rescue, only to suffocate in the process. Some of his compatriots, however, survived and brought their stories back to Pliny the Younger, who recorded them. Pliny the Younger gave us such a detailed description of the eruption we now call similar eruption formations plinian eruptions. As an Aside: When Pliny the Elder wasn’t busy being a military commander, he wrote a 37 volume encyclopedia, which was widely referenced for the next 1000 years. A wealthy home known as a villa, preserved in Herculaneum. Because of the speed in which Pompeii and Herculaueum were buried by ash, many buildings have been preserved practically intact. Rather than simply studying the footprints of buildings, which is often the case for Roman ruins, archeologists can study buildings as they originally appeared, complete with wall paintings. Vesuvius remains an active volcano and is considered one of the most dangerous in the world due to its proximity to Naples, situated no farther from the volcano than Pompeii and with an metropolitan population of over 3 million. 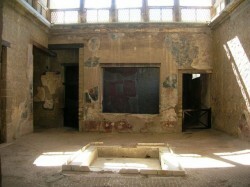 Excavation of Herculaneum. Modern city behind it, with Vesuvius in the background. Created by Xtreambar, public domain under creative commons. Featured image at top of article from the Repository blog.